Our friendly team of dental professionals look forward to inviting you and your family to our Surrey dental practice. Our dedicated dental team always puts our patients first, focusing on personalized, professional care and prevention so they can enjoy healthy smiles. Take a moment to get to know our team by reading the biographies below. 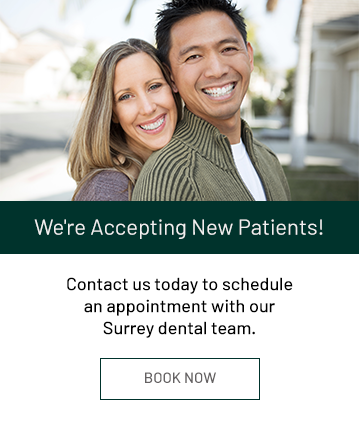 We look forward to meeting you in our Surrey dental office! Elizabeth graduated as a Certified Dental Assistant at CDI College, Surrey, BC in 2015. She provided patients with amazing dental knowledge and care so they can feel calm and comfortable during their visits. Elizabeth enjoys being a part of The Guildford Smiles Dentistry Team. She loves working hand in hand with a team that genuinely cares for patients. Rania has been at Guildford Smiles since day one and is a key member of our team. She graduated from Sadat Academy for Management Sciences in Egypt, and is one of the bilingual members of our team, speaking both Arabic and English. Rania is a mother of two young pretty girls, and loves meeting new people and helping when she can. She used to teach fun games to kids in Sunday school in her church in Surrey. Rania is excited to be part of The Guildford Smiles team, as it allows her to meet more people and help them with their insurance coverage, and help make their dental experience positive and stress free. Susan is a graduate of Dentistry from The Philippines. She enjoys her work as a CDA and is always happy to assist with any questions you may have about your dental health. On her days off she loves spending time with her family and friends. Hiba is originally from Palestine. She finished her bachelor degree in computer science in Lebanon. At work, Hiba answers the phones, books and confirms appointments, and takes care of accounts. Our goal is to help patients with their dental needs, and Hiba is amazing at helping however she can. "We’re really like a family here! " When she's not working, Hiba enjoys spending time with her son.